The unsaved world has much to say about “love” these days, promoting harmony and ecumenical compromise at all cost; but that is NOT Biblical love. So many people nowadays condemn religion and speak of “love” as a magic solution to the world's problems. They make such statements as: “If only the world had love then all the killing would stop” or “If you have love then nothing else matters.” They are dead wrong! This apostate form of New Age thinking is especially common amongst islanders along the equator (e.g., Hawaii) where the weather is always warmer, ecumenism flourishes, modesty is almost non-existent and true Christianity is very unpopular. What does the Bible teach? Jesus said in John 4:24, “God is a Spirit: and they that worship him must worship him in spirit and in truth.” God is a Spirit and MUST (not perhaps nor maybe; but MUST) be worshipped in TRUTH. All the love in the world means nothing if you don't have the truth. Some of the most loving people in this world are going to split Hell wide open when they die, because they have never been born-again as the Bible mandates for salvation... “Jesus answered and said unto him, Verily, verily, I say unto thee, Except a man be born again, he cannot see the kingdom of God.” Proverb 14:12 warns, “There is a way which seemeth right unto a man, but the end thereof are the ways of death.” It is infinitely better to trust the Scriptures and obey the Gospel; than to foolishly trust one's instincts and feelings and go to Hell (2nd Thessalonians 1:8,9). No amount of love will suffice on Judgment Day when the books are opened and one has to give account for all their sins (Revelation 20:11-15). The Bible teaches that we cannot worship God without truth; no matter how much love we may possess. Biblical love always includes the truth. If one cannot worship God without truth, then it is critically important to have THE TRUTH. This is “why” I make such a big fuss over modern corrupt versions of the Bible. If Satan succeeds in perverting the Word of God, then he has changed the truth of God into a lie... “Wherefore God also gave them up to uncleanness through the lusts of their own hearts, to dishonour their own bodies between themselves: Who changed the truth of God into a lie, and worshipped and served the creature more than the Creator, who is blessed for ever. Amen” (Romans 1:24, 25). The Devil came to Eve in the Garden of Eden, perverting God's Word (Genesis 3:1). The Devil came to the Jews through false prophets, perverting God's Word (Jeremiah 5:31). The Devil came to Jesus in Matthew 4:6, perverting God's Word. 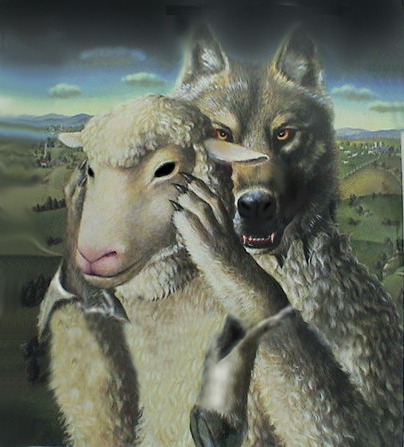 And the Bible warns that Satan will come to us via wolves in sheep's clothing, perverting God's Word (Matthew 7:15; 2nd Corinthians 11:13,14). Satan's primary goal is to pervert and corrupt the truth. This is why the truth is always found amongst lies. Thankfully, God always makes the truth obvious to those who desire and want it. When the Apostle Paul speaks of “charity” (i.e., love) being the greatest in 1st Corinthians 13:13, carefully notice in 1st Corinthians 13:4,6 that Paul says, “Charity... Rejoiceth not in iniquity, but rejoiceth in the truth.” As evidenced by 1st Corinthians 13:6, Biblical love rejoices in THE TRUTH. The world's false love excludes truth. What the world commonly calls “love” is nothing more than sinful compromise. Satan has duped many people into believing the BIG LIE that love means refraining from preaching against sin, or taking a stand for righteousness or offending anyone. That is NOT love at all. As we just learned from 1st Corinthians 13:6, true love rejoices in THE TRUTH. If we truly love someone, then there should be no hesitation to tell them the truth. This is why believers are supposed to go soulwinning (Matthew 28:19,20), i.e., because lost sinners are going to Hell and we have a duty to warn them of the judgment to come (Proverb 11:30; Luke 8:15; Daniel 12:3; Matthew 28:19,20). 2nd Thessalonians 2:9,10 state: “Even him, whose coming is after the working of Satan with all power and signs and lying wonders, And with all deceivableness of unrighteousness in them that perish; because they received not the love of the truth, that they might be saved.” This passage of Scripture speaks about the 7-year Tribulation Period, after the Rapture, when the masses of this world will eagerly follow the Antichrist, thinking he is a wonderful person. Most people in the world today DON'T love the truth, nor do they have any desire to hear the truth. When you tell them the truth they become defensive and argumentative. Some people get very angry. Only a small fraction of people love and receive the truth of the Gospel to get saved. The first step to salvation is a desire to know the truth. Sadly, most religious people today refuse to acknowledge the truth, which Jesus witnessed in his time as well... “And he said unto them, Full well ye reject the commandment of God, that ye may keep your own tradition.” Hundreds-of-millions of Catholics have heard the Gospel preached; but they are stubborn, grounded firm in their sinful pride, and are committed to the demonic doctrines of Catholicism. Woe unto the Catholic Church for teaching a false gospel and for their idolatrous worship of statues and icons. Hell will be hot enough! Society is saturated with lies today, intended to blind us from the truth. The truth needs to be told. We must not censor or suppress the truth for the sake of popularity, expediency or making money as MOST ministries do nowadays. The average pastor wouldn't dare preach against the blatant crimes being committed by our government leaders in Washington. Most ministers don't care. It's not an issue with them. If we as believers don't care about crime in high places, then who will? It is tragic when unsaved people care more about the future of our children than we as professed Christians do. In fact, it is utterly irresponsible and apostate of America's churches. Woe unto silent churches! This is why I personally believe that the Lord's return, i.e., the Pretribulation Rapture is very near. Even so come Lord Jesus. Amen! Biblical love is rooted in gratitude towards God and a love for the truth... “Because that, when they knew God, they glorified him not as God, neither were thankful; but became vain in their imaginations, and their foolish heart was darkened” (Romans 1:21). A thankful heart is the first step to finding the truth, as we've read in Romans 1:21. Most people today are ingrates and don't appreciate what God has done for them. Those who are appreciative and humble are much more likely to obey the truth of the Gospel than ingrates who blame God for the world's problems. What the world thinks is true love is nothing more than a strong fondness for one another; but this is NOT Biblical love. God's love is unconditional, which means that it has nothing to do with the person who is the object of that love. In other words, no matter what you do to God, He will still love you (Romans 5:8; 1st John 3:16). This is vastly different than the conditional love of the world that requires a person to meet certain requirements to continue receiving that so-called love. This is why the divorce rate is so high—because people don't have God's unconditional love in their heart. God's unconditional love is based upon one's gratitude towards God for sending His Son into the world to pay for our sins. If Jesus was willing to die for our sins, then we ought to be willing to suffer for our loved one's. Thankfully, Jesus died for all men (1st John 2:2); thus, making salvation available to anyone, rich or poor, healthy or sick, beautiful or ugly, nice or mean, religious or non-religious, who will acknowledge their GUILT of sin (Romans 3:19) and BELIEVE on the name of the Lord Jesus Christ for forgiveness of sins (Acts 4:10-12; 10:43; 16:31). We are saved by HIS RIGHTEOUSNESS, i.e., the righteousness of Jesus Christ made possible only by the precious literal blood that He sacrificed for our sins. This is THE TRUTH of God's Word. It is called the Gospel. Jesus paid a debt that He did not owe, because we owed a debt that we could not pay. Jesus died, was buried and rose again after 3-days (1st Corinthians 15:1-4), and applied his physical blood to the mercyseat in Heaven (Hebrews 9:12) for our justification. You won't hear this truth in most religious denominations today, nor will you hear it from the greedy televangelists, nor will you hear it on the Oprah Winfrey Show; but I love the truth and want you to go to heaven when you die. In closing, I wrote this article because many people nowadays have the erroneous notion that love is all that matters. Not so. And any so-called “love” that excludes THE TRUTH is fraudulent. God's love always dwells amongst truth. Anyone who speaks about love, while diminishing the importance of Biblical doctrine, is of the Devil. The Beatles sang their hit song, All You Need Is Love. No my friend, you need truth more than anything, for without the WORD OF TRUTH you cannot be saved and escape the fires of Hell, which is where John Lennon and George Harrison are burning this moment. Note: All quotes are from the trustworthy King James Bible.